Samphire is a succulent from the parsley family that grows in rocky and marshy areas near saltwater sources, like shorelines and salty mudflats. There are two types of samphire - marsh and rock. Marsh samphire is the more common and resembles tiny shoots of asparagus but grows on muddy, sandy flats, often around estuaries and tidal creeks. Rock samphire is much trickier and harder to get to, requiring a huge amount of risk-taking as it is usually in high, out of the way places. Rock Samphire was even mentioned in Shakespeare's King Lear - "Half-way down hangs one that gathers samphire; dreadful trade!" Most samphire is of the marsh variety. How Do I Eat Samphire? Without a doubt, freshness is paramount to the enjoyment, and once away from the water it will diminish fairly quickly. Many supermarkets will now sell samphire, some year round. This is not the same as fresh seasonal Norfolk samphire which is available only in July and August. Enjoyable as it is to be simply plucked and eaten, samphire works so well alongside many foods, of course, fish but it is a good partner to a dish of lamb, cutting neatly through the fat. Add samphire to your salad for add texture and nutrients. 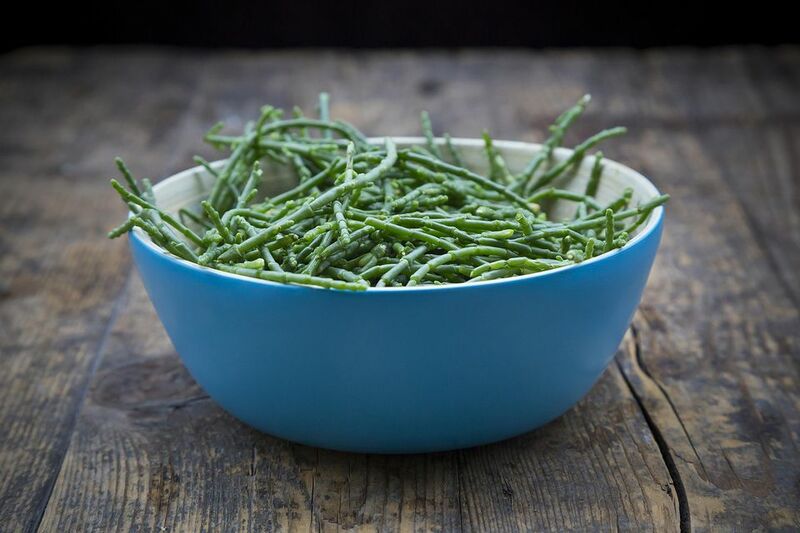 In Norfolk, samphire is traditionally served with vinegar and black pepper. The slight resemblance samphire has to asparagus cannot go unnoticed. The appearance is not dissimilar but they do differ in size considerably; samphire is tiny. Though it can be eaten raw, samphire, like asparagus, is delicious lightly steamed and served with butter and makes a great accompaniment to fish and seafood as mentioned above. The main thing to consider when cooking samphire is to rinse it thoroughly to remove any grit and excess salt. The name samphire is a corruption of "Saint Pierre" - St. Peter - the patron saint of fishermen. Samphire is also known as Glasswort, sea beans, and baby asparagus.